I feel a bit dirty giving a positive score to a Bruckheimer film, but for an action/adventure film, a genre I don't typically go for, it works pretty well. Despite it's silliness, it kept my attention and provided a nice two hour distraction. Certainly about a hundred times better than anything Spielberg could ever put together. A historical heist film with a fitting over-the-top lead to go with an implausible story, National Treasure falls flat with laughable dialogue, an inane plot, and a bevy of cliche, boring characters. Its a fun adventure story, even though it is incredibly stupid and Nicolas Cage isn't as crazy as he could be. Good with the bad. Bad with the good. It wouldn't matter. National Treasure is exciting. The score is to a high standard. Nic Cage is unusually subtle. 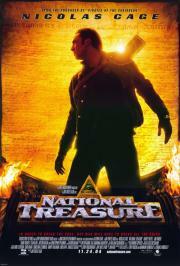 All in all, for better or worse, National Treasure is a personal favorite. Wonderfully imaginative, adventurous, and hilarious. Awesome characters. Awesome story. Never fails to cleverly entertain. Bruckheimer delivers another movie as packed with entertainment as Dead Man's Chest.